308 Marlborough is located on the south side of Marlborough, between Fairfield and Gloucester, with 306 Marlborough to the east and 310 Marlborough to the west. 308 Marlborough was designed by architect Frederic H. Moore and built in 1878 by Daniel Weeks Beckler, builder, and Michael Nolan, mason, one of five contiguous houses (302-304-306-308-310 Marlborough) built for speculative sale. Click here for an index to the deeds for 308 Marlborough. By the 1879-1880 winter season, 308 Marlborough was the home of Dr. Horace Dupee, a physician, and his wife, Octavia Watts (Gardner) Dupee. He also maintained his medical office there. They previously had lived (and he had maintained his office) at 84 Dover. They continued to live at 308 Marlborough during the 1881-1882 winter season, but moved thereafter to 304 Marlborough. Harvey Jewell had died in December of 1881, and on October 2, 1882, 308 Marlborough was purchased from his estate by Rachel A. (Dunlop) Thayer, the widow of lithographer and real estate investor Benjamin W. Thayer. Their unmarried adult children lived with her: Henry B. Thayer, a broker, Ida Tucker Thayer, Mary J. Thayer, and Grace Thayer. They previously had lived at 1 Pelham. They continued to live there during the 1892-1893 winter season, but moved thereafter to 97 Crawford. On November 2, 1893, 308 Marlborough was purchased from Rachel Thayer by Miss Alice Parker of Hanover, New Hampshire, the daughter of Rev. Henry Elijah Parker, a professor of Latin at Dartmouth College, and Mary Elizabeth (Brackett) Parker. Alice Parker married later that month to Dr. Benjamin Tenney, a physician, and they made 308 Marlborough their home. He also maintained his medical offices at the house. Alice Tenney’s father, a widower, was living with them at the time of his death in November of 1896. During the 1903-1904 winter season, the Tenneys were joined at 308 Marlborough by Dr. Henry Melville Chase, Jr., a physician, and his wife, Blanche (Knox) Chase. 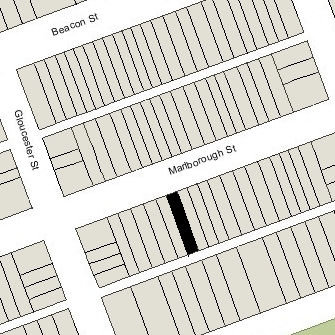 They had married in May of 1903, and 308 Marlborough probably was their first home together. Dr. Chase also maintained his medical office at 308 Marlborough with Dr. Tenney. By the 1904-1905 winter season. the Chases had moved to 237 Marlborough. Dr. Chase continued to maintain his office at 308 Marlborough until about 1908, when he moved to 409 Marlborough (which the Chases also made their home). 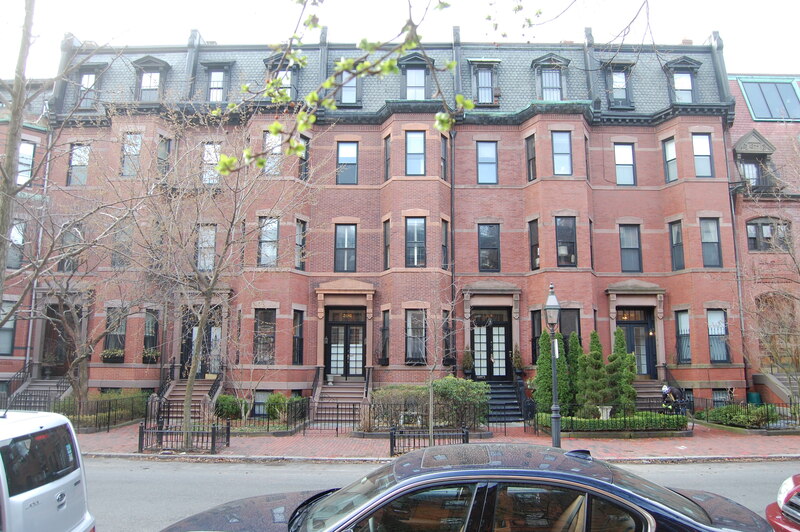 In 1910, and possibly earlier and later, Benjamin Tenney’s unmarried sister, Alice Tenney, also lived at 308 Marlborough. 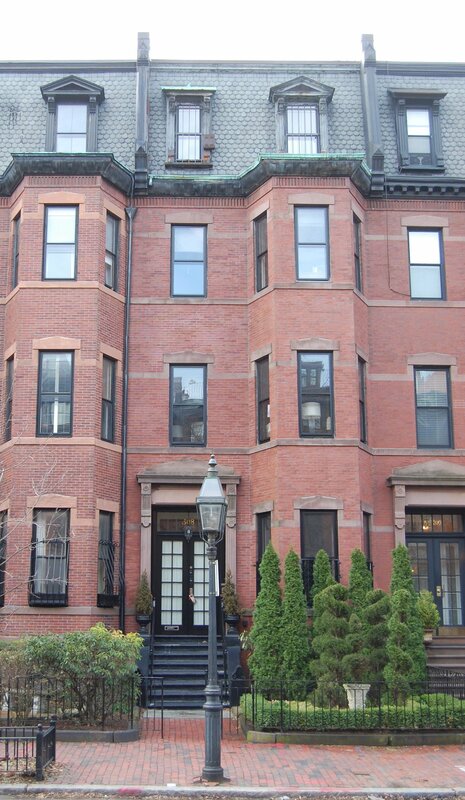 The Tenneys raised their two children, Dorothy Parker Tenney and Benjamin Tenney, Jr., at 308 Marlborough. Dorothy Tenney married in October of 1920 to Alden Simonds Foss. After their marriage, they lived in Andover and then New York. Benjamin and Alice Tenney continued to live at 308 Marlborough. Benjamin Tenney, Jr., lived with them. During the 1927-1928 winter season, they were joined by Alden and Dorothy Foss. Benjamin Tenney died in January of 1928. By the 1928-1929 winter season, Alice Tenney was living at 67a Chestnut and Benjamin Tenney, Jr., had become a resident obstetrician at Boston Lying-In Hospital at 221 Longwood, where he also lived (he married in June of 1929 to Constance Richmond Vaillant, after which they lived at 108 Charles and then at 309 Marlborough). Alden and Dorothy Foss moved to Cambridge; he was assistant treasurer of a rubber company at the time of the 1930 US Census. On October 25, 1928, 308 Marlborough was purchased from Alice Tenney by Helen May (Harding) Bigelow, the wife of William DeFord Bigelow. They previously had lived at 30 Gloucester with his father, Albert Smith Bigelow. They also maintained a home in Cohasset. William DeFord Bigelow was a building contractor. He had served in World War I from 1916 to 1919, first as a member of the American Field Service, organized in 1915 by Harvard Professor A. Piatt Andrew to provide ambulance drivers to aid the French, and then with the US Army Ambulance Service until 1919. After the war, he became president of the New England Oil Refining Company and then a real estate dealer. During the 1933-1934 winter season, the Bigelows were living elsewhere and 308 Marlborough was the home of Dr. Hanns Sachs. He was a psychoanalyst and professor of psychoanalysis at Harvard Medical School. An early student of Sigmund Freud’s, he had emigrated from Germany in 1932. By the 1934-1935 winter season, he had moved to 168 Marlborough. The Bigelows were again living at 308 Marlborough during the 1934-1935 winter season. Helen Bigelow died in March of 1935, and William Bigelow moved soon thereafter. On May 23, 1935, 308 Marlborough was purchased from Helen Bigelow’s estate by Emma Almeida (Ruth) Hawkins, the wife of Vernon Mills Hawkins, a lumber dealer. They also maintained a home at Plymouth. Vernon Hawkins died in June of 1952. Emma Hawkins continued to live at 308 Marlborough until about 1970. On July 27, 1970, 308 Marlborough was purchased from Emma Hawkins by Stephen Toby Kunian, an attorney, and his wife, Lois Gersten (Rome) Kunian, a real estate broker. On March 30, 1993, Stephen Kunian transferred his interest in the property to his wife. On December 22, 2003, Lois Kunian entered into a “Preservation Restriction Agreement” with the National Architectural Trust for the purpose of ensuring preservation of 308 Marlborough’s exterior. 308 Marlborough remained a single-family dwelling in 2017.